The Supreme Court nominee should publicly condemn Trump's comments if he's "a truly independent judge," the Senate minority leader writes. Republican lawmakers are calling Supreme Court nominee Neil Gorsuch’s recent criticism of President Donald Trump a sign that he would be a fair and independent-minded judge on the nation’s highest court. But Senate Minority Leader Chuck Schumer (D-N.Y.) isn’t buying it. In a scathing op-ed in The New York Times on Friday, Schumer wrote that Gorsuch’s private conversations with senators on Capitol Hill, in which the federal judge expressed dismay with Trump’s recent attacks on the judiciary, should not inspire confidence in his nomination. Ron Bonjean, a spokesman for Gorsuch, confirmed the exchange to CNN on Wednesday. But Thursday morning, Trump took to Twitter to accuse Blumenthal of “misrepresenting” Gorsuch’s sentiments and to resurrect a criticism that the senator had implied at least once that he had served in Vietnam when in fact he had been stateside during the war. 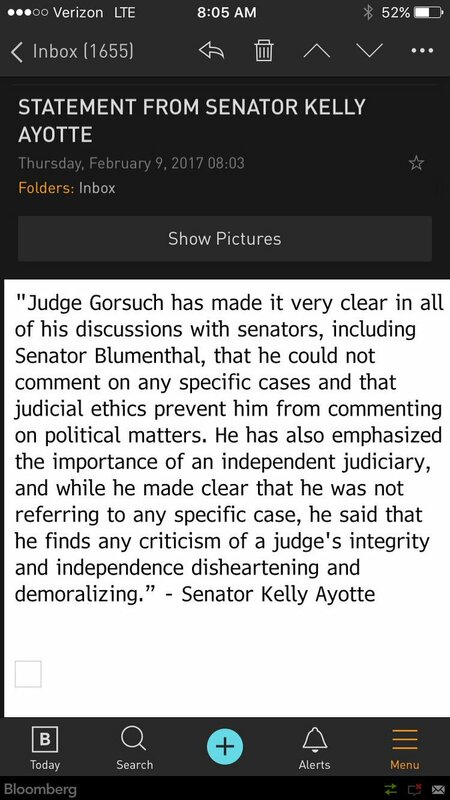 Hours later, former Sen. Kelly Ayotte (R-N.H.), who is aiding the judge through the nomination process, released a statement claiming Gorsuch’s remarks condemned “any criticism” of a judge’s integrity and were not aimed at Trump specifically. Sen. Ben Sasse (R-Neb.) said Thursday that Gorsuch had confided in him about Trump’s tweet as well and that the judge’s private admission should pacify Democrats skeptical of his nomination. But the Senate minority leader didn’t draw the same conclusions about the nominee. Schumer wrote that Gorsuch had expressed the same concerns to him during a meeting on Capitol Hill but claimed that the judge refused to speak out publicly on the matter. Schumer’s essay calls Gorsuch’s motives into question, implying that the judge’s quiet criticism of Trump’s actions merely serves to create the appearance of independence in order to gain the support needed from Democrats to secure his seat on the bench. Schumer’s article echoes Blumenthal’s comments, also on Thursday’s “Morning Joe,” that Gorsuch explicitly told him to “feel free to talk publicly” about their conversation. Schumer concluded in his essay that Gorsuch had thus far failed to prove he could rule on the Supreme Court independently of his personal preferences. The Democratic senator wrote that he repeatedly asked Gorsuch about his views on several landmark court cases during their meeting but that the judge refused to answer the questions. Read Schumer’s op-ed in The New York Times.